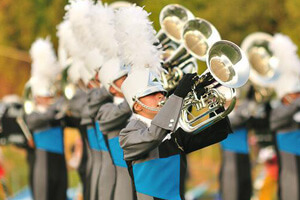 The Drum Corps International Tour event FirstBEAT took place on Sunday, June 20, in Carolina Crown's hometown of Ft. Mill, S.C. Participating corps helped to "PINK OUT" cancer, showing their support by wearing pink as part of their uniforms. Of particular note were Crown's hot pink plumes which are now being sold by the corps as a fundraiser for cancer awareness. Competitively, Carolina Crown (1st, 75.900) held a lead over the Cadets (2nd, 75.100) and Cavaliers (3rd, 71.800). Spirit (4th, 66.000) members made their first appearance of the season in style decked out in brand new uniforms for 2010, while Teal Sound (61.200) competed for the very first time in the Word Class division. The show also included performances by two Atlanta-based all-age corps, Alliance and the CorpsVets. Photos courtesy Chris Maher, corpsreps.com.